Happy Tuesday and Happy July! I have a thing about tags and that's all there is too it. Now add an element that is a shaker...oh my. Now I'm in tag/shaker heaven! 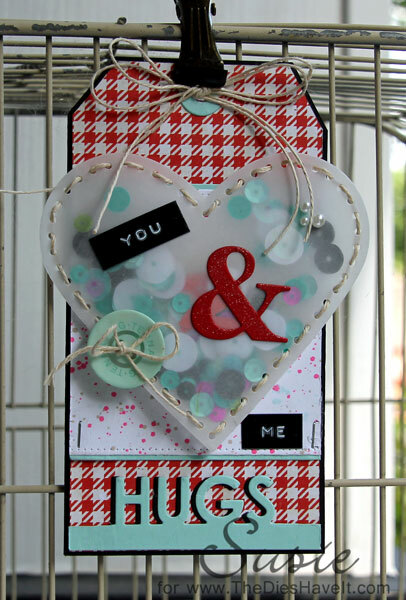 I made this little shaker heart when I was at this year's MFT Stamps retreat. It was supposed to go on a card....but when I got home, I made some other plans for it. I love red and aqua together and the more I fiddled with this, the more I liked it. I even got a bit old school when I pulled out my Dymo label maker for the YOU and ME. I love a bit of the unexpected. I am happy to report that my new tag is now hanging on my little tag rack along with lots of other tag friends. Be sure to have a great day and I'll see you right here tomorrow.